After Ray Milland turned down the leading role in Bride of Vengeance, Paramount contractee John Lund stepped into the role of Alfonso D'Este, second husband of the notorious Lucrezia Borgia. 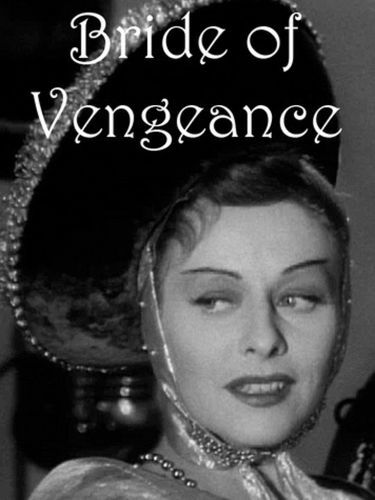 The ruthlessly ambitious Lucrezia is played by Paulette Goddard, who seems ill at ease in the role. MacDonald Carey is better suited to his assignment as Cesar Borgia, the real villain of the piece. The plot proper gets under way when Lucrezia seeks revenge for her first husband's murder. The supporting cast is an odd lot, especially Billy Gilbert as Beppo, a wandering minstrel. A far better recreation of the Borgia "regime" was offered in the like-vintage Prince of Foxes.